I'll tell you small secret. Panasonic developers work such way - 98% of the development team are being transferred to new camera right after v1.0 firmware is done. For demanding cameras you can have 15-20% working on v2.0. All else is usually done by 1 or 2 guys remaining. Camera development is also not much similar to modern big software development where main OS is exactly same for everything, only drivers differ. At least they fixed the One Push AE function. These was were handheld and with old 14-140mm lens that came with my GH5. Wasn't shot as well as the lion dance videos I posted on page 78 but I thought I'd post them here anyway. GH5 firmware v2.4 is released. Fan expo Boston Cosplay contest. 4K 60fps Leica 12-60mm. Only select people was able to be in the front but since their was still seats left, I really wished I had moved. Someone’s horns ends up being in my way making it difficult to shoot at times. GH5 + Leica 12-60mm lens. At times I was changing the exposure to see how it'll look when I get home. Not easy to take a video of this event when 2 matches are happening at the same time and so I'l gradually go back and forth. Not fun when your legs aren't 100%. In September, I had an operation to remove titanium that was put in my ankle many years ago to help my bones heal. I'm still recovering. Also had an operation in 2015 to fix my toe. Did something while in High school that caused my toe to break and never got it fixed until 2015 many years later. Toe is better now and hopefully the ankle will end up being better with the titanium out after I recover. I do plan on getting a gimbal for the GH5. If I do get better, it'll be easier shooting with the extra weight. I included everything without any editing. Lets just say this hobby can be time consuming as is and I try not to spend much time editing. True that when all I do is combine all clips and hit export, a tiny part of each clip is muted. Man I wish the GH5 didn't do that. @PauloTeixeira I'm sorry for your woes. But it does not excuse the rudeness of posting an unedited 50 minute video because you are too lazy to edit. I am sure there are some things in your video worth watching (I have watched lots of your videos), but I, and I am sure most others, are not going to take 50 minutes of their lives to find them. What you did is called data dumping, and it is insulting and arrogant This is because it assumes that viewer's time is worth little and your video is so great we all want to spend a lot of time watching it. All the rest of us spend a lot of time trying to distill the best of what we shoot so viewers benefit. We spend more time editing than shooting. We have viewers in mind, not ourselves, when we post videos. Our videos may still be worthless, but not because we are looking for sympathy and because we are lazy. I wish you a good recovery, and look forward to more of your videos, when you get back to editing them. A lot of times I also want people to see as much of possible and if I had decided edit this piece a bit, I probably would have cut a few minutes at the very most. I've gotten a whole lot of praise from people thanking me for shooting videos of many events. Not everybody can go to a certain event. Theirs many events out that that never got much video footage in which people wish their were more. If they were to stumble upon a long video of an event they've wanted to see, most would be happy regardless how it was edited. I wish their was more videos of different events out their. You have so much anger toward me because of the way that I do some of my videos that it's as if I've done something extremely horrific to you and a lot of people. Even a video like this Azores piece that I actually did edit for a while seamed to have ticked you off. So it's long, I've included every clip and theirs no movement. Still got a lot of likes and comments. In another old clip that I shot for fun in which the concert lighting was bad, you went on and on about the white balance and almost acting like it was the end of the world. Everybody has opinions and yes constructive criticism can be good but you really take things to the next level with all your anger. I didn't see any of your comments on my lion dance videos that I posted on page 78. Dont mistake criticism for anger. And your dizzying fast pans and 280 degree circles in your 50 minute video are also assaults on the senses just in the beginning. Lots of places to edit that would still let us experience the event, if you cared about viewers actually benefiting from the event.. Do you see any others dumping a long unedited video like yours of events? The shots are mostly well exposed, you know how to use the camera, but your rationale for not editing is not credible. You have a history of taking jabs at me for a very long time on different camera forums. It's one thing to talk about things that's wrong with a video but that's not the only thing your dong. Like those insults on the wrestling video. Another video example. I posted a clip of the Yi 4K+ to AVSForum. I was only allowed to use it briefly from the company at Cine Gear. All I did was harass them to let me use it. I also provided a native sample directly from the card for people to download. That is the only thing I was able to shoot and people were still grateful for me doing it. This is what you decided to write after I post the clip. 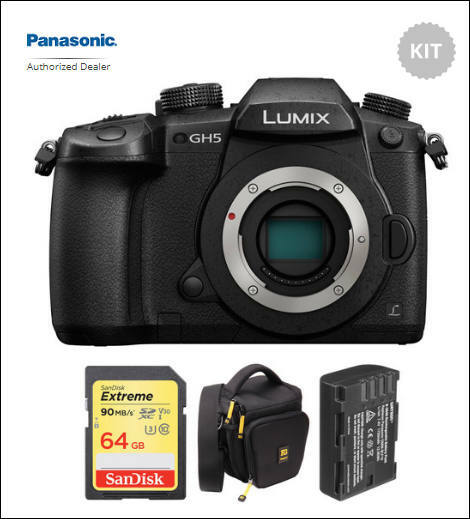 Just noticed that Amazon UK are selling the GH5 body only new for £1270. Probably the cheapest it's ever been! @Energy80s Your Amazon Link of 5 days ago has now gone up to £1599 (from £1270). All set now for Black Friday and the Panasonic cashback offer. True that when all I do is combine all clips and hit export, a tiny part of each clip is muted. Man I wish the GH5 didn't do that. We ran into this issue unfortunately when dealing with sync between the 2x GH5 cameras and my audio files for a feature film I worked on earlier this year.